Hannah’s art at the Display. All photos by Elska. August 6 marked the 20th annual display of the talents and knowledge of the Known World’s artisans and craftspeople at the Pennsic War. As in previous years, the variety and scope of work was amazing! From the tiny beaded flowers by Lady B’Gen van der Sterren of the Middle Kingdom, the intricately detailed Elsa snowflake jewelry box by Fredis Sjona of the Kingdom of Atlantia, and the delectably edible sugarpaste playing cards by Baroness Tatiana Ivanovna, if you could not make it to this years’ display, make sure to mark it down for next year! While the A&S Display is not a competition, this year’s display also featured A&S consultation tables. Each entrant could voluntarily request feedback from practiced judges to help prepare for the higher degree of expectations that happen at more competitive levels. Even if an artisan does not plan on entering competitions, they may use these tables as great opportunities for low-key constructive feedback. Because of several conflicting meetings, I only had a few hours to sit at my display and capture the work of my fellow artisans. While I always intend to immortalize all present, my excuses beforehand to the few I might have missed… From my documentation it seems that from the 70+ entries the Kingdom of the East had the most artisans, with a whopping 23 displays. The East was followed loosely by Atlantia and the Middle, with 11 artisans each, then Æthelmearc with nine, and a handful of dedicated Northshield, West, Ealdormere, Meridies, and Calontir artisans. 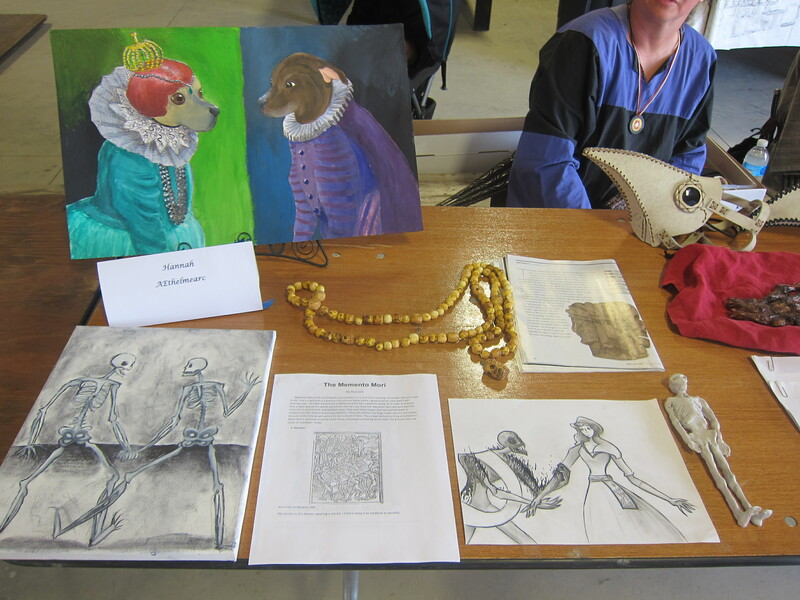 I met the following Æthelmearc artisans at the Display and enjoyed their works of art. Thank you all so much for sharing!